11.2. Storing Security information in an ebRIM CSW Catalogue. For many years OGC has been developing a suite of standards defining web services interfaces and encodings for geospatial processing. The suite includes a Web Map Service (WMS), a Web Map Tiling Service (WMTS), a Web Feature Service (WFS), a Web Coverage Service (WCS), a Web Catalogue Service (CSW), the Sensor Web (SWE) suite of services, etc. These service interfaces and their implementations have, more or less, been developed independently of one another resulting in isolation and poor integration between them. For example, consider a map generated by a WMS. A client or user cannot easily determine which source data was used to create the map and how to download that source data though an OGC data service such as WFS or WCS. Furthermore when one considers the Publish-Find-Bind paradigm, OGC can only partially support the full potential of this paradigm. This is because OGC structured catalogues can only register services in isolation of other related services and cannot automatically determine the relationships among services and the resources they offer. Defining a new service, called the Web Integration Service (WIS), which allows for the discovery and access to integrated sets of OGC web services deployed at an endpoint. Specifying a means of discovering and describing associations between web resources (both OGC and non-OGC). Defining extensions to the OGC catalogue to allow the service to harvest and make discoverable a rich set of linked OGC and non-OGC resources. A new operation, named GetAssociations, is defined as an extension such that existing OGC services (WMS, WFS, WCS, etc.) may implement this operation in order to support rich auto-discovery. This operation enables OGC web services to externalize their internal association knowledge about their content and relationships to other OGC and external resources. For example, a WMS would know if the source data for a layer it offers is a Shapefile, or a WFS feature type, or another WMS layer (i.e. cascading), or if a WMTS layer exists that renders the same information more efficiently. This "internal knowledge" can now be externalized via the GetAssociations operation. The primary subject of this Engineering Report is to define methods and apparatus, via the Web Integration Service, to better integrate a loosely coupled set of OGC services. Such a proposal and related discussion is within the purview of the OGC Architecture DWG because the overarching nature of the work presented in the Engineering Report (ER) is germane to multiple OGC standards. This ER defines a generic discovery operation named GetAssociations. The function of this operation is to allow services to make accessible their internal knowledge of associated OGC and non-OGC resources resulting in a richer set of metadata describing each service. For maximum effect, this operation needs to be defined for all OGC web services and thus the content of this engineering report needs to be reviewed by the OWS Common 1.2 SWG for inclusion into the next version of that standard. Finally, this engineering report defines an extension package for CSW-ebRIM (see OGC 07-110r4). The function of the package is to instrument a CSW-ebRIM catalogue with the necessary identifiers, associations and classification schemes to allow catalogues to harvest and properly register the richer set of metadata made available via the web integration service and the GetAssociations operation. These extensions need to be reviewed and commented on by the ebRIM AP of CSW SWG. The Architecture DWG considers overarching architectural issues that are germane to multiple OGC standards, including mechanisms for describing and invoking services in a heterogeneous distributed network. The work described in this ER is clearly of an overarching nature relating to multiple standards and describing a mechanism for integrating, associating and discovering multiple OGC web services and other OGC and non-OGC resources. This ER shall be submitted to the Architecture DWG, OWS Common 1.2 SWG, and the ebRIM AP of CSW SWG for review and comment. This engineering report defines a new OGC service named the Web Integration Service. A web integration service in a aggregation service whose purpose it to provide, for the purpose of discovery, a list of reference to a suite of other, perhaps related, OGC services. This engineering report defines methods and apparatus to allow OGC web service to externalize this internal association knowledge. This engineering report describes how associations between OGC and non-OGC resource can be represented in XML. This engineering report further defines a new operation; named GetAssociations, that existing OGC web services can implement to allow client applications to interrogate an OGC web service about its internal association knowledge. This engineering report defines an extension package for the CSW-ebRIM profile (see OGC 07-110r4). The profile encapsulates all the identifiers, associations and classification schemes necessary to allow an OGC CSW-ebRIM catalogue to register OGC web services and, by means of the GetAssociation operation, register the resources those services offer and the associations between those services, their offerings and other OGC and non-OGC resources. "Consider making the GetResourceById() operation mandatory for all OGC data services"
Define an additional, optional, conformance class for WIS’s that implement the GetResourceById() and/or GetAssocations() operations. The WIS would need to cascade those requests down to the services that it is aggregating. Extend the security implementation to determine the visibility of service endpoints in the WIS capabilities based on user authorization. Propose solutions to reconcile authentication and authorization for the WIS, catalog and services. It may be useful for a content provider to expose subsets of services through the WIS. For example, an environmental data provider may wish to provide separate entry points for oceanographic and atmospheric data, along with an additional entry point to expose both data holdings. A direct solution might be to stand up a separate WIS instance for each data holding. However, care must be taken to avoid collision between instances, while minimizing redundancy and resource usage. It may be preferable to extend the specification so that a single instance can support subsets of services. A "passive" approach is for the WIS capabilities response to contain groupings or metadata attributes to categorize services. The client would be responsible for processing the response to identify the groupings. A more active approach is to implement a parameter or operation allowing a client to specify a simple category filter in the service request. For a service implementation that does more than simply returning a static capabilities response, software tools may aid in configuration of the service content. It may be useful to implement an interface to manage the list of service endpoints and the metadata cache, including the ability to add/remove endpoints, restrict access to content, and configure cache settings. Tools to facilitate the creation of service associations may help speed the adoption of the Web Integration Service. A software library could provide developers with an easy means of implementing the GetAssociations operation. A configuration tool for this library could be used for data providers to quickly configure association metadata for their services. NOTE: This OWS Common Standard contains a list of normative references that are also applicable to this Implementation Standard. In this document an attribute is an XML attribute unless otherwise specified. A feature can occur as a type or an instance. The term "feature type" or "feature instance" should be used when only one is meant. In this International Standard, the system is a web feature service. The resource is not held in any data store that is directly controlled by that service and thus cannot be directly retrieved by the service. In general, a schema is an abstract representation of an object’s characteristics and relations to other objects. 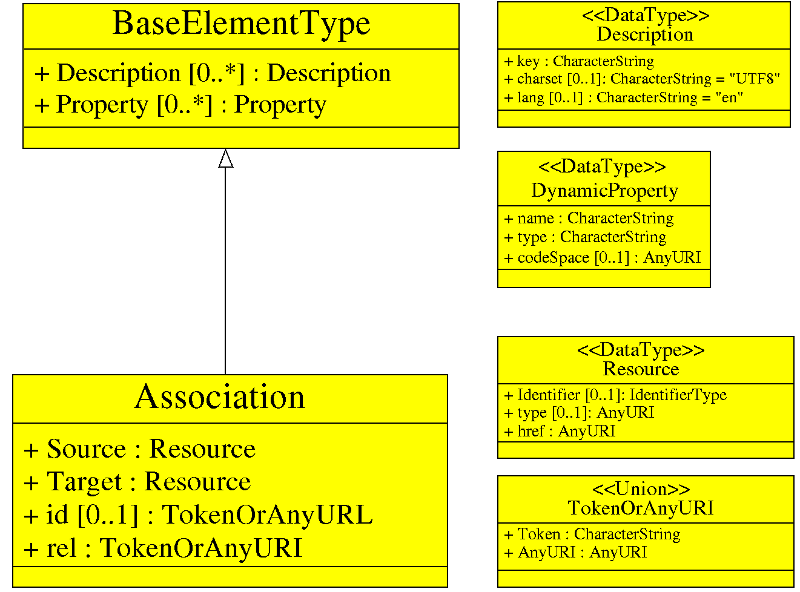 An XML schema represents the relationship between the attributes and elements of an XML object (for example, a document or a portion of a document). Many diagrams that appear in this standard are presented using the Unified Modeling Language (UML) static structure diagram, as described in Subclause 5.2 of [OGC 06-121r9]. This main content of this engineering report is divided into three clauses. The first clause, titled Web IntegrationService, defines the resources, operations and responses of a new OGC service that can be considered an aggregation point — for the purpose of discovery — for a suite of OGC web services. The second clause, titled Associations and the GetAssociations operations, defines a new, generic, OGC operation named GetAssociations. This clause defines an XML-encoding and KVP-encoding for a GetAssociations operation suitable for use with the KVP-GET, XML-POST and SOAP OGC service bindings. This clause also defines an associations resource that is suitable for use with a service that implements a REST style architecture. The third clause, titled Catalogue extensions, defines a CSW-ebRIM extension package that allows a catalogue to use the web integration service and the GetAssociations operation/resource to harvest a much broader set of metadata about a service than is currently available through the capabilities document alone thus support rich discovery. There is currently no way for a service provider to advertise which services are available at an endpoint and do so in a way that is compatible with the investments already made implementing OGC web service. This is especially true for OGC catalogues which must be aware of every single endpoint that is offered in order to be able to harvest the service metadata and make it discoverable. Furthermore, the associations that can be discovered between OGC services the, content they offer and other OGC and non-OGC resources is very limited. Currently, a client can interrogate an OGC web service’s capabilities document to discover what content it offers and perhaps and association to a metadata document describing the content. The inability to discover what OGC web services are available at an endpoint and discover the rich associations that link OGC web services to the content that the offer and to other OGC and non-OGC resources significantly restricts the usefulness of OGC catalogues and especially of CSW-ebRIM catalogue which has the ability to capture all this information. The Web Integration Service (WIS) is an aggregation service whose only purpose is to provide a list of references to a suite of other, perhaps related OGC services available at an endpoint. In keeping with the evolutionary refinement and reuse goal stated in Clause 6.1, the web integration service only defines a single operation, GetCapabilities, and responds using a standard OGC capabilities document whose content section lists the available services accessible at that end point. A web integration service shall implement the KVP-encoding of the GetCapabilities operation. A web integration service may optionally implement the XML-encoding of the GetCapabilities operation. 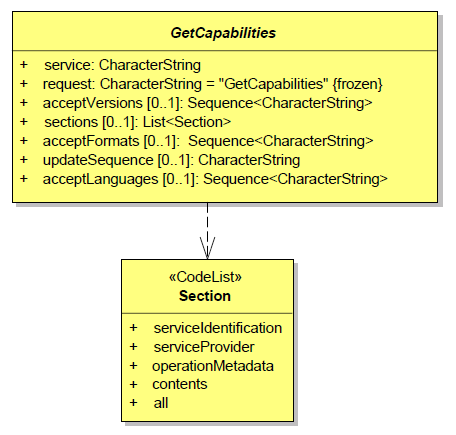 The following figure defines the schema of the GetCapabilities request. The KVP encoding of the GetCapabilities request shall be as specified in OGC 06-121r3:2009, 7.2.2. The value of the service parameter shall be fixed to "WIS". The following XML Schema fragment defines the XML-encoding of the GetCapabilities request. The WIS’s response to a GetCapabilities request is essentially a standard OGC capabilities document with a content section composed of zero or more ows:ServiceIdentification sections each describing one OGC web service available at the endpoint. Each service is characterized by its type (i.e. WMS, WMTS, WFS, etc. ), the base URL of the service and the standard ServiceIdentification description of the service from Web Service Common (see OGC 06-121r9). The value of the "type" parameter can be a token – such as the three letter acronyms commonly used by OGC – or a URI identifier for the service. The value of the "baseURL" parameter is the service URL to which GetCapabilities request (see 06-121r9, Clause 7) parameters are appended to form a valid request URL. The following XML Schema fragment defines the schema for the XML-encoded response to a WIS GetCapabilities request. This engineering report defines an additional WIS operation named "NoOp" that all clients shall ignore. The NoOp operation only exists to satisfy XML validation requirements for capabilities documents imposed by the Web Service Common standard (see OGC 06-121r9, 7.4.6) which requires that OGC web services implement the GetCapabilities operation plus one additional operation. Clearly, the web service common standard did not anticipate the usefulness of a service that only implements the GetCapabilities request. A change request has been posted against OGC 06-121r9 to remove this requirement (see OGC 14-026). Given the focus on security in Testbed-12, it is worth mentioning that the content of a WIS capabilities document may be tailored to suite the authentication level of the user. An authenticate user may see more services listed in the capabilities document than a non-authenticated user might. The question may be raised about the difference between a WIS and a CSW registry service. Unlike a CSW, the WIS provides a light weight, standalone, peer-to-peer discovery mechanism that clients may use to interrogate a providers offerings at an endpoint. The discovery possible using the WIS is not quite as rich as that possible using a CSW but it may be sufficient for many user cases including the harvesting use case described in Catalogue extension package clause. From an implementation standpoint, the WIS is certainly a more lightweight implementation. Since this capabilities document is composed mostly of standard OGC components it is an easy task to extend an OGC catalogue to consume this document. The catalogue can then automatically determine which services are offered by this provider and harvest each one in turn also maintaining the associations between the web integration service and its child services. When a service provider deploys a suite of OGC web services each component service typically exists in isolation and external clients are unaware of the relationships that might exists between these services, their offerings and other OGC and non-OGC web resources. The services themselves, however, typically have much more internal knowledge about such relationships or associations. Services know what data sources where accessed to provide their offerings; they know what other representations might exist, etc. For example, a WMS knows if the source data for a layer it offers is a SHAPE file, or a WFS feature type, or another WMS layer (i.e. cascading), or if a WMTS layer exists that renders the same information more efficiently. In short OGC web services have a lot of internal association knowledge that is currently inaccessible to client applications, especially catalogues. A great deal of added value can be derived if this internal association knowledge can be externalized. Thus, the scope of this clause is to define methods and apparatus to allow OGC web services to externalize this internal association knowledge. This clause describes how associations between OGC and non-OGC resource can be represented in XML. This clause further defines a new operation; named GetAssociations, that existing OGC web services can implement to allow client applications to interrogate an OGC web service about its internal association knowledge. This clause defines a general XML Schema for representation associations between two resources. An association is logically of the form "SOURCE REL TARGET" where the SOURCE resource is the subject of a directional RELationship of the specified type with the TARGET resource (e.g. layer X renders feature type Y). OGC web service resources are resources that are only accessible from within an OGC web service. The classic set of OGC resources — WMS map, WFS feature type and WCS coverage — are examples of OGC web service resources since the only way to access instances of each is through the services that offer them. Thus, OGC web service resources are not addressable using a URL alone. URL-addressable resources are resources which can be accessed directly via URL. Many OGC resources are URL-addressable. Examples include OGC web services, which are accessible via their base URL or symbology encoding documents stored in some web-accessible location. For the purposes of this engineering report the only recognized URL-addressable OGC resources are those for which an identifier has been registered with the OGC Naming Authority (OGC NA). OGC web service resources are distinguished from URL-addressable resources because two components are required for access; the base URL of the OGC web service offering the resource and the service-specific identifier which locates the resource within the service. Interaction with an OGC web service can only commence once the base URL of the service has been discovered. Communication with the OGC web service commences with the client obtaining the capabilities document of the service by appending the appropriate GetCapabilities request parameters to the previously-discovered base URL of the service. The service-specific identifiers for the OGC web service resources the service offers can then be obtained from the capabilities document’s content section. 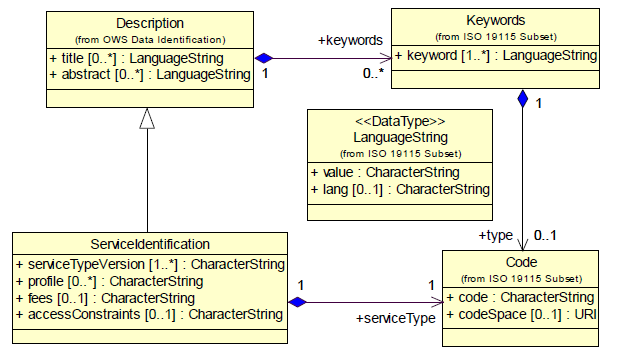 The following UML diagram defines the schema of an association. The following XML Schema fragments defines the XML-encoding for an association. The "Source" parameter shall identify the source resource of the association. The "Target" parameter shall identify the target resource of the association. The "rel" parameter shall be used to specify the association type. The canonical value of the rel attribute shall either be a token taken from the IANA Link Relations registry (see RFC 5988) or it shall be a URI registered with the OGC Naming Authority. Vendor or domain specific "rel" values may also be used. However, this engineering report does not assign any specified meaning or interpretation to these values. A association Parser shall not fail if it encounters an associations with an unrecognized "rel" value and is free to ignore that association. The "id" parameter may used to assign an identifier to the association itself. The following XML fragment defines a reference to a resource that participates as the source or target of an association. If the resource is a URL-addressable resource then its URL shall be specified using the "xlink:href" parameter and its type shall be specified using the "type" parameter. The "Identifier" parameter shall be omitted in this case. If the resource is an OGC web service resource, then its base URL shall be specified using the "xlink:href" parameter, its type shall be specified using the "type" parameter and the service-specific identifier that locates the resource within the OGC service offering the resource shall be specified using the "Identifier" parameter. If the service-specific resource identifier within the OGC web service is scoped then its namespace shall be specified using the "namespace" parameter. The OGC service type serving the resource shall be deduced from the specified resource type. For example, a WMS layer resource is served by a WMS while a WFS feature type resource is served by a WFS. The following XML Schema fragment defines a container for a set of associations. The Associations element is a container for zero or more Association elements. This engineering report defines the following MIME type to represent an XML document that encodes a set of associations: application/ogc-as+xml. The following tables define standard identifiers for resources and association types used by OGC. This is by no means a comprehensive list but represents the main set of OGC web services and their resources. An OGC service supporting data crowdsourcing. A version number may be appended to the end of the HTTP-URI or URN to reference to a specific version of a service. A collection of WMS layers. A collection of WMTS layers. As previously discussed, OGC web services have internal knowledge about what associations exist between the service, its offerings and other OGC and non-OGC resources. The GetAssociations operation is the means by which an OGC web service may be interrogated about the associations of which it is aware. Once externalized in this way, this association information can be automatically harvested and made discoverable from OGC catalogues creating a richer environment for discovery. It is anticipated that existing OGC web services, wishing to participate as part of an integrated suite of OGC web services, would implement this operation as an add-on to the existing set of operations that the service implements. It is further anticipated that this operation shall eventually be defined as a mandatory operation for all OGC web services in the OGC Web Services Common standard (see OGC 06-121r9). The document shall be posted as a change request against OGC 06-121r9. 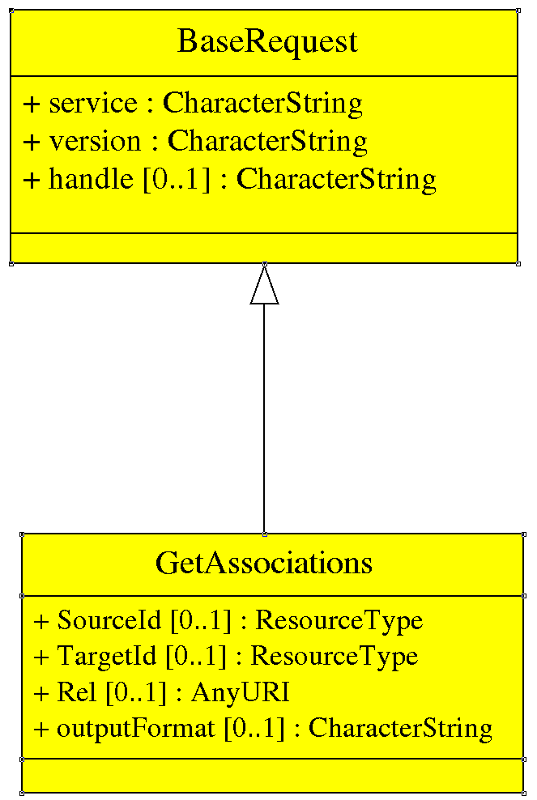 The following UML diagrams define the request and response for the GetAssociations operation. The mandatory service parameter of the GetAssociations operation shall encode the service identifier of the service being invoked to execute the operation. The mandatory version parameter of the GetAssociations operation shall be the fixed values of "1.0.0". The optional contents parameter may be used to interrogate the known association of a specified subset of resources that a service offers. If the parameter is omitted the response document shall contains all knows associations. The optional outputFormat parameter may be used to request the response in a specific format. The default value is application/ogc-as+xml (see 8.3.5). Other output format values are allowed (e.g. a JSON response) to which this engineering report does not assign any meaning. The following table defines the KVP-encoding for the GetAssociations operation. The response format of the operation. The default values is application/ogc-as+xml. The following XML Schema fragment defines the XML-encoding for the GetAssociations operation. Servers implementing the REST architectural style shall provide a /associations resource. The query parameters SOURCEID, LOCALSOURCEID, TARGET, LOCALTARGETID, REL and OUTPUTFORMAT (see the GetAssociations KVP encoding table) may be appended to this resource path to query specific association information. Without any parameters, an OGC web service implementing the GetAssociations operation shall return a document containing all known associations. In this example, a service implementing the GetAssociations operation would return all associations where "Rel==Renders" for the specified SourceId. The response to a GetAssociations operation, when the output format is the default value application/ogc-as+xml, shall be a set of associations encoded as an XML document that validates against the schema describe in the Associations clause. To properly harvest the GetAssocations response it is important that each object returned either as a part of the source or the target also be harvested into the catalogue. This can accomplished in a number of ways but the following basic algorithm below should be used as a guideline. 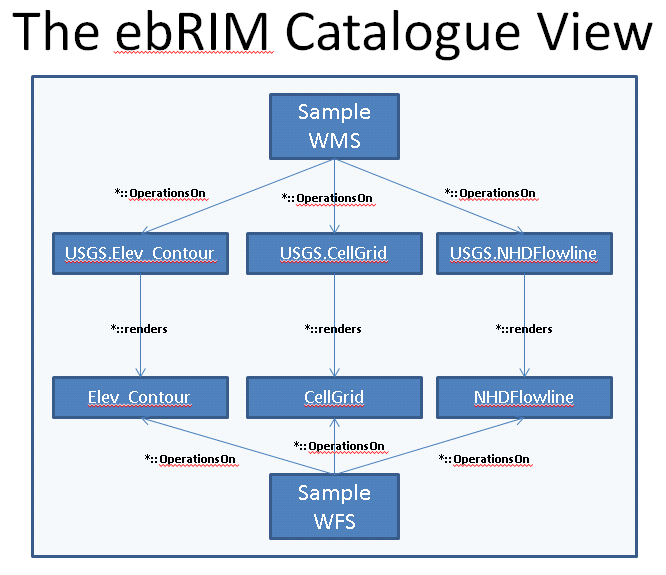 The figure ebRIM Catalogue View presents a typical view of what the various ebRIM Associations might look like in an ebRIM database once all the appropriate services and other objects have been successfully harvested. A central component of a deployed suite of integrated OGC web services is a catalogue. The catalogue encapsulates the knowledge of the system making the resources that the system offers and the associations between those resources discoverable to both internal components of the system as well as external clients. For this Testbed-12 work item, the CSW-ebRIM profile (see OGC 07-110r4), a profile of the OGC catalogue (see OGC 07-006r1) that uses ebRIM (see OASIS regrep-rim-3.0-os), is chosen as the primary catalogue. This choice is motivated by the fact that ebRIM is a flexible meta-model that already includes structures to register resources and the associations between them as well as allow resource to be classified using internal as well as external classification schemes. The primary means of harvesting or registering an OGC web service into a CSW-ebRIM catalogue is to use the Harvest operation (see OGC 07-110r4, Clause 14) to read the service’s capabilities document and then map that document into the catalogue’s ebRIM information model. This clause defines a service integration ebRIM package that encapsulates all the identifiers, associations and classification schemes necessary to allow an OGC CSW-ebRIM catalogue to register OGC web services, the resource those services offer and the associations between those services, their offerings and other OGC and non-OGC resources. This clause defines a set of identifiers that shall be used to map the capabilities document of an OGC web service into the ebRIM information model of an OGC web registry service (see OGC 07-110r4). The table Service Type Identifiers defines a standard set of service type identifiers for OGC web services. These identifiers are used to define classification nodes within the ebRIM model that allow ebRIM Service records to be classified according to the type of service being represented. The canonical ebRIM service type classification scheme is defined in Annex B. These identifiers may also be used as the value of a slot, named resourceType that may also be used to tag a service record with the type of OGC web service it represents. The table Content Type Identifier defined a set of identifier that may be used as the value of the "objectType" parameter within ebRIM to identify the type of OGC web service content being represented by the catalogue record. 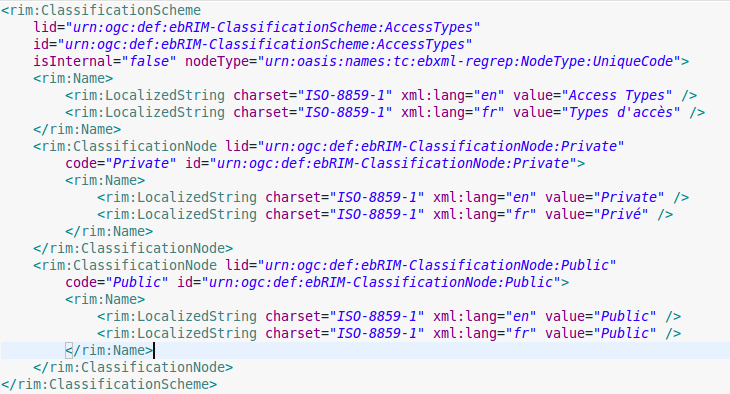 These identifiers are used to extend the canonical ebRIM object type classification scheme (see Annex B). The following table lists a set of identifiers for OGC and non-OGC document types commonly used to describe OGC resources. These identifiers are used to define a canonical ebRIM classification scheme named HarvestResourceType (see Annex B). Metadata document conforming to the FGDC standard. Metadata document conforming to the ANZLIC standard. Metadata document conforming to the ISO 19139 standard. Metadata document conforming to the ISO 19119 standard. Metadata document conforming to the ISO 19115 standard. A metadata document containing an ebRIM classification scheme. Harvesting OGC web service is accomplished by reading and mapping the service’s capabilities document into the information model of the CSW-ebRIM catalogue. A service’s capabilities document can be identified by a client providing the complete URL to the capabilities document (e.g. http://www.someserver.com/wfs?service=WFS&request=GetCapabilities) or by providing the baseURL of the OGC web service and letting the catalogue form the necessary GetCapabilities request. The latter case gives the catalogue server more control about what to harvest especially in the case of a suite of OGC web services offered through a WIS. The following set of identifiers may be used in the latter case to identify that a base URL is being used to identify the capabilities document of the OGC web service – and thus the catalogue needs to formulate a complete GetCapabilities request in order to obtain the capabilities document. These identifiers will typically be used as the values of the resourceType parameter of the CSW Harvest operation. The table Association Type Identifiers defines a set of identifier for association types that may exist between two resources represented in ebRIM. The identifiers in this table are used to extent the canonical ebRIM association type classification scheme (see Annex B). These values shall be used as the value of the "associationType" property of the Association object within ebRIM to represent the type of association between registered resources. The following table lists association identifiers that are useful in the context of OGC service integration and are already defined in the canonical ebRIM AssociationType classification scheme. Associates two resources where one resource is a collection and the other resource is a member of that collection (e.g. a collection of WMS layers that share a common theme). Associates two resources where one resource is a web integration service and the other resource is another OGC web service offered by the WIS. The ebRIM model provides extensible metadata via a slot mechanism. Slots are a name and value list pair that provides additional metadata about a registered object. Among other things, slots are used in this standard to map values found in an OGC’s capabilities document into the ebRIM model. The following table lists a set of identifiers that may be used as the value of the "name" parameter of a slot. These identifiers are used to define a canonical ebRIM SlotName classification scheme. Describes any access constraints associated with the resource. The base table name within an RDBMS used to store a resource. Instruction for contacting a responsible party for the resource. A CRS associated with the resource. Any fees associated with obtaining the resource or a copy of the resource. A Boolean flag indicating that the catalogue record representing a resource also has an associated repository item entry. Any hours of service associated with the resource. A list of keywords associated with the resource. The layer limit associated with a WMS service. The legend URL for a WMS. HTTP method name for a service binding. The maximum map height that a WMS can serve. The maximum map width that a WMS can serve. May be used to provide a reference to the provider of the resource. A list of formats indicating the representations available for the resource. The position with an organization if the resource is a person. A Boolean indicating whether a WMS map layer is queryable. A subtype for a resource represented in a CSW-ebRIM catalogue. This slot is typically used to differentiate one OGC web service type from another. A role associated with a resource. The list of supported version of the resource; typically supported server versions. An identifier from a classification scheme that is associated with the resource. A list of operations supported by the resource. A namespace associated with the resource. A human-readable title associated with a resource. A URL associated with a resource. Typically used to provide a link for accessing the resource directly. The complete identifier is formed by appending the value in the Identifier column to the prefix "urn:ogc:ebxml-regrep:slotName:". The following tables list identifiers for spatial and non-spatial data types. These values may be used to indicate the value type of a slot parameter. The identifiers in Table 11 are defined in the ebRIM standard (see OASIS regrep-rim-3.0-os). The identifiers in Table 12 are defined as part of the Basic Package of the csw-ebRIM standard (see OGC 07-144r4). Annex B defines an ebRIM packages for service integration that defines that following classification schemes: ServiceTypes, HarvestResourceTypes, SlotNames. The process of registering an OGC web service into the catalogue involves reading the service’s capabilities document and then mapping the contents of that document into ebRIM thus making the information discoverable to catalogue clients. OGC capabilities documents are composed of a number of sections some of which are common to all services and some of which are specific to a particular service. This clause describes the mapping of the common sections into ebRIM and further describes the mapping of the content sections for the WIS, WMS, WMTS, WFS and WCS services into ebRIM. The following table maps the element of the ServiceIdentification section of an OGC capabilities document into ebRIM. The following table maps the elements of the ServiceProvider section of an OGC capabilities document into ebRIM. The following table maps the elements of the OperationsMetadata section of an OGC capabilities document into ebRIM. This clause defines the mapping of the content sections of the WIS, WMS, WFS and WCS into the ebRIM model. The content section of a WIS is simply of list of ServiceIdentification sections describing the set of services that the WIS offers. The content section of a WIS is not harvested directly. Rather each service listed in the WIS content section is harvested and an OffersService association is registered between the WIS and the harvested child service. The following table maps the metadata describing a WMS layer that contains nested layers into ebRIM. Layers that in turn contain child layers are referred to as themes in this standard. The relationship between a WMS offering a theme and the theme itself shall be encoded in ebRIM using the operatesOn association. The relationship between a WMS layer or theme and its child WMS layers shall be encoded in ebRIM using the HasMember association. Each child layer is encoded into ebRIM as a sub-theme of WMS layer. The association between a layer and a child layer or theme is encoded into ebRIM using the HasMember association. The following table maps the metadata describing a WMS layer into ebRIM. The relationship between a WMS offering a layer and the layer itself shall be encoded in ebRIM using the operatesOn association. The relationship between a WMS theme and a WMS layer it contains shall be encoded in ebRIM using the HasMember association. The following table maps the metadata describing a WMTS theme into ebRIM. In addition to these mappings, an operatesOn association shall be created between the service offering the WMTS layer and the WMTS layer itself. The relationship between a theme, its sub-themes and any WMTS layers shall be encoded in ebRIM using the HasMember association. This is encoded in ebRIM as a HasMember association between the theme and each child layer. The following table maps the metadata describing a WMTS layer into ebRIM. In addition to these mappings, an operatesOn association shall be created between the service offering the WMTS layer and the WMTS layer itself. The following table maps the metadata describing a WFS feature type into ebRIM. In addition to these mappings, an operatesOn association shall be created between the service offering the feature type and the feature type itself. The following table maps the metadata describing a WCS coverage offering into ebRIM. In addition to these mappings, an operatesOn association shall be created between the service offering the coverage and the coverage itself. The methods shall behave as described for the_GetAssociations operation_. The general idea here is that service providers expose a public capabilities document. Then, within that document they advertise the methods that are available for users and/or clients to authenticate against. Any entity that authenticates successfully would then be given access to other services that would not be accessible otherwise. When security information is advertised in a service’s capabilities document it is very important that this information is captured properly so that it can be accessed and/or displayed later. Typically, when a service capabilities document is published in a CSW catalogue it creates an ebRIM Service object that is then associated with various applicable objects within the ebRIM data model. 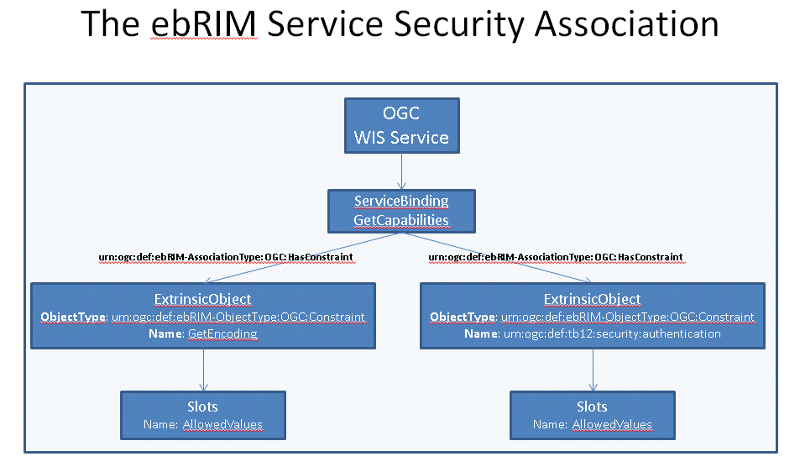 Because a service’s associated security constraints are tied to its operations, it is recommended that a new ebRIM Association object with an association type called urn:ogc:def:ebRIM-AssociationType:OGC:HasConstraint be used to associate each ebRIM service binding to its associated constraints. Each constraint object should be a new ExtrinsicObject with an object type = urn:ogc:def:ebRIM-ObjectType:OGC:Constraint that has an associated Slot called AllowedValues which contains the list of values permitted for the constraint. The figure, ebRIM Service Security Association shows what an ebRIM catalogue might look like after a WIS capabilities document has been successfully harvested. During a typical CSW publishing flow for a Web Integration Service (WIS) it is recommended that the CSW catalogue maintain which of the services listed in the GetCapabilities document have Public access and which ones have Private access. If you recall, the Private services are those returned by the service after the user and/or client has been authenticated. The WIS endpoint consists of a WIS servlet endpoint, capabilities harvester, and database cache. To allow flexibility in the content returned by the WIS, the GetCapabilities response is generated on demand from a list of services. The list of service endpoints known to the WIS is specified in an administrator-configurable property. The WIS invokes a capabilities harvester to retrieves the capabilities for each known service. Metadata parsed from the capabilities responses are timestamped and cached in a database table. The timestamp is used by the WIS to decide whether to use the cached metadata or retrieve a fresh capabilities response. The WIS cache also records security information for each service. For the purposes of Testbed 12, the security information simply indicates whether or not the service is exposed in the WIS public capabilities. This could be extended in the future to accommodate additional security restrictions. Compusult’s WIS endpoint has been implemented as a component of Web Enterprise Suite (WES). Access to the WIS endpoint is controlled by WES, requiring authentication via HTTP Basic Auth or PKI client certificate. In addition to the regular service endpoint, the WIS implementation exposes a publicly-accessible capabilities URL that advertises security annotations as described by OGC 16-048 (OWS Common Security Extension ER). An unresolved issue is how to reconcile security restrictions for the WIS, its contents, and the catalog. In an operational scenario, the WIS and catalog could have separate authentication credentials. Each service in a WIS could have its own security constraints. Catalog publishing clients will need to be aware of this and handle authentication for each service appropriately. Additionally, a catalog containing anything other than public data will need to enforce security restrictions on the published records. With respect to visibility, each service is treated as simply either public or non-public. When publishing to the catalog, the same authentication credentials are used for both the catalog and the WIS. The public capabilities endpoints are used when publishing services to the catalog. Introduction This annex contains the normative schemas for the Web Integration Service, the GetAssociations request and the GetAssociations response. Web Integration Service (WIS) Implementation Specification. WIS is an OGC Engineering Report. Copyright (c) 2014 Open Geospatial Consortium. Web Integration Service (WIS) Engineering Report. Copyright (c) 2010 Open Geospatial Consortium. An identifier of a particular resource within an OGC web service. namespace via the "namespace" attribute. The namespace (if applicable) of the identifier. a URL-addressible resource or an OGC-Web-Service resource. service type must be deduced by the specified resource type. wfsFeatureType resource is served by a WFS server. The identifier of the resource within the OGC web service. The type of the resource, using a controlled vocabulary. since it is not a resource served by an OGC web service. base URL of the OGC web service that serves the resource. the TARGET resource. E.g., "layer X renders feature type Y". The source resource of the association. The target resource of the association. The association type, using a controlled vocabulary. The following ebRIM package defines object identifiers, classification schemes and association that may be used by a CSW-ebRIM catalogue to harvest and register the resources described by the capabilities documents of OGC web services. On the GetCapabilities() operation – I don’t think it is necessary to modify this operation. It is sufficient to have a standard service metadata document with two defined operations; getRespourceById() and getAssociations(). GetResourceById() is required by OWS Common. GetAssociations() can do everything you are trying to do in the service metadata. Furthermore, it will avoid further balkanization of the service metadata. The WIS does not modify the GetCapabilites() operation in any way. It is the standard GetCapabilities operation that every other OGC web service uses. The issues is with the response. Currently, OWS common requires that 2 operations be defined in the operations metadata section of a capabilities documents. A change request was posted a couple of years ago (OGC 14-026) to remove this restriction. This is a backward compatible change would allow a WIS to be implemented without having to implement any other operation (i.e. simple implementation) and still let existing OGC services operate as they always have. The GetResourceById operation, as far as I know, is not mandatory for all services. Rather OWS common says: "This typical operation is specified as a base for profiling by specific OWS specifications.". So I believe that OWS common says that if your service includes a GetResourceById operation then it should be derived from the base defined therein. The WIS handles the 2-operation minimum requirement by defining a dummy no-op. However, the idea of implementing one or both of GetResourceById and/or GetAssociations() is not a bad one. It would impose an additional burden on the implementation of a WIS, since the WIS would need to cascade those requests down to the services that it is aggregating but that extra complexity could be handled by adding an additional, optional, conformance class to the WIS. I have added this to the future work section. Consider the value of making a mandatory getResourceById() operation which is defined the same for all OGC services. Since all of the OGC resources are defined by a URL and resource identifier, then the getResourceById URL and the identifier are all we need to retrieve that resource. We can consider this in a CR to OWS Common. On identifiers – I suggest using URNs rather than URLs. The URLs imply that the services are only accessible through HTTP and that the identifiers resolve to the identified resource. This will usually not be the case. Using a URN for the identifier makes a clear distinction between the resource identifier and the URL for accessing that resource. New standards and new major versions of existing standards shall use http URIs for persistent public OGC resources to replace OGC URN identifiers defined in previous standards and versions, unless the OGC-NA approves an exception. At the time, the use of http URIs was (a) seen as a way to resolve deployment challenges and (b) provides an opportunity for easier engagement with broader communities. So OGC was asked to consider taking the next step, and mandate the use of http URIs for persistent identifiers in OGC standards. However, that has not entirely happened. There are still OGC http uri deployment challenges. Further, URNs are still very much in use. The IESG processes a number of new URN proposals each year. Many (most) internet standards use urn’s and any number of new revisions or RFC still use urn’s. Other standards organizations are also still using urn’s. And of course there was the backwards compatibility issue." In any case, for all non-CSW ebRIM-specific identifiers in this ER, I have defined both a URN form and an HTTP-URI form — just to cover all the bases! Nice – this goal is more likely to be achieved if the getAssociations() operation can be implemented without any changes (outside of the additional operation metadata) to the existing service. Consider a use case from the tactical sensor world. These sensors are not connected to the Internet. Rather they form and re-form mesh networks based on who is currently in range (the sensor can move). Usually one of the participants in the mesh also has up-link capability. GetAssociations() can tell me which sensors are currently accessible through the up-link. It could also support a temporal filter so I can discover which sensors have been associated over a period of time. This is useful if I am looking for archived sensor readings. This really calls for a JSON-LD output format. I am not exactly sure how you could implement a GetAssociations() operation without modifying the service. The primary reason for the existence of the operation is to allow services to advertise the associations they are usually aware of internally. In static, or pseudo-static case, I suppose you could implement the operation on top of a static Associations document without necessarily modifying the service to which the associations pertain. But I don’t think that is the general case. Just like the use case you describe, participants in the mesh network know who they have been and are associated with. The idea is to make this internal or private information available through a public API. In the current testbed a primary use case was to have a catalogue harvest this association information to support rich discovery. However, once exposed through a public API the universe of possibilities for this kind of knowledge is quite large as illustrated by your use case. I quite like the use case you describe and I am pleased to say that it could be accommodated with the current proposal since associations can have properties and one of those properties could be a time stamp. I agree that JSON-LD would be useful output format and have added this to the future work section. First cut as schemas for wis, associations, etc.